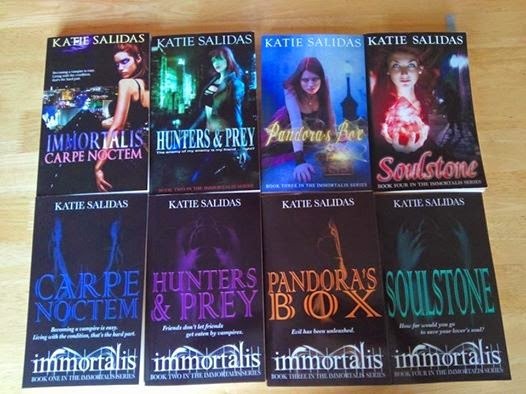 Katie Salidas: What Makes A Cover Stand Out? What Makes A Cover Stand Out? After re designing the covers to my Immortalis series, I asked this question on my facebook page and no one could give me a single definitive answer. Sure, people could tell me what they liked on a cover, but I wasn't really hearing an overall indicator of what worked and what didn't. To be completely honest, I don’t think there is one specific thing that works for cover art. Genre has a lot to do with it, and age range as well. Kidlit, Middle Grade, YA, NA, and Adult all need a little something to distinguish as well. As for individual preference… Some people go for flashy covers. Some like and respond to any cover with a hot man on it. (Yeah… me too!) Some prefer there to be no faces on a cover. Others prefer there to be a face that matches the character within. Some enjoy more symbolic covers, while others like something more face-value. As you can see, there is any number of directions you could go with this. After talking with readers and looking at what is available and selling well in the marketplace, I've found two key elements to cover art. There is no magic bullet that will make your book sell, however these two elements are crucial in making your book stand out on shelves. And when I say that, I don’t mean flashy, swirly, artsy fonts, though they are pretty. What I mean is something easily read. Large enough on the cover that it can be clearly read at thumbnail size but not overpowering whatever image you choose. In print or on the ebook shelves, you want people to easily see what book they are reading and by whom. No second guessing. This is an area that seems to be in flux. Sometimes you see covers that are flooded with visual imagery, and it works. Then there are other times where it just looks like a cluttered mess. While I have seen it work and not work, I tend to lean towards the cleaner and simpler of things. Make your cover stand out with an image that begs the reader to look deeper, rather than filling the cover with storytelling pictures. And if possible, avoid faces. Above, I mentioned readers being split over character lookalikes and just using bodies. Overall I believe people want to use their own imagination, so avoiding faces and using body images helps this. Readers can still imagine who they want. I’d love to hear your own input on the topic. Feel free to leave a comment below.